(SAM) The next morning we awoke early and raced like a bat out of hell in order to be the first to see the rock paintings and petroglyphs. It was deserted so we were glad. A sign said we needed a guide. We did not care. It took us awhile, but we eventually found where the rock carvings were. There were hundreds of them. I would be looking for them and then I would see a bunch on the rock right in front of me. 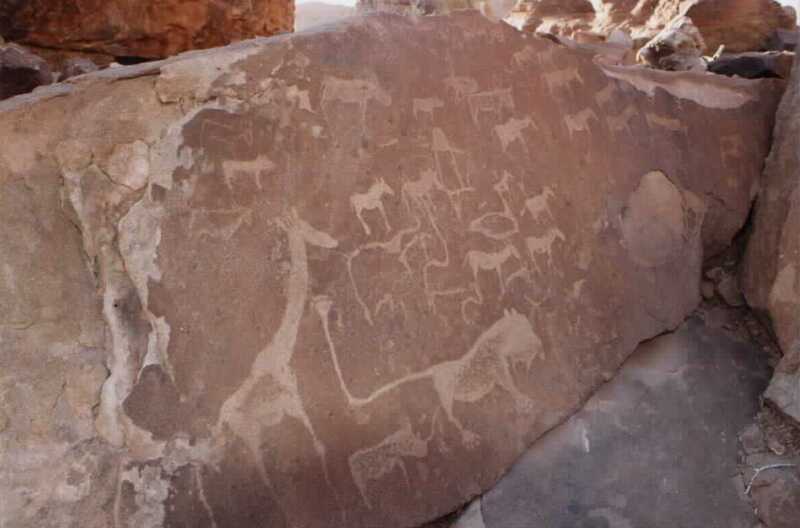 All the rock carvings were of animals: elephants, lions, rinos, deer-like creatures, girafs, and a little dog named Sue. There were no rock carvings of people. A little farther away we saw what looked like actual red paintings. These were of men with bows and arrows. By this time other tourists and the guides had arrived. On the way out, we had to pay the entrance fee. The price of a guide was included in the fee but because it was chump change, we did not protest. It was more fun to find all the carvings and paintings ourselves. We had a long drive ahead of us to Etosha Game Reserve, but along the way we saw the petrified forest. The trees were old and big and stone-like, a little hard to get excited about. But what made the visit fun was an 18 year old Tameron guide named Ingrid. See the video to learn how to count to ten in Tameron, which is similar to the San clicking. Paul was quite taken with her. This would be a great story for a modern made for TV version of Romeo and Juliet. Paul and Ingrid. Ingrid’s Tameron name was much more interesting but a lot harder to remember. (CHRIS) We got on the road to Etosha, Paul double-checking the facts in the books about this park, Namibia’s #1 tourist attraction. He found out that the western 3rd of the park is not open to the general public and is reserved for certain tour companies. So we re-routed a little bit and headed north. After brushing away some of Khorixas’ beer-drinking, pee-stained, window-washin’, ne’er-do-wells, we got gas and food and continued. As we approached Etosha, we saw some of those proud warthogs next to the road. At the gate, they had to make sure there were sites left at the camp 17 k’s away before they would let us in. We saw some antelope and giraffe during those 17 k, but we wanted to secure our camp spot, so we did not stop. After pitching the tent, we drove into the park proper towards Gemsbok Lake. We were 5 minutes late, but, sure enough, the gates were closed and locked. Just as the books said would happen, we got a lecture and a fine when the official let us in. It was for 80N$ (13US) but we were supposed to pay it at a city post office after we read and signed that we were guilty. So, we thanked the man and then promptly lost the ticket in the morass that is the cab of our vehicle. Since now the people were the zoo exhibit (we were locked in this complex with the animal free to come look at us thru the fence), we explored the human options within. There was a dearth of young women and the ones that were around were Granola Girls. This hearty muscular stock had mean faces, bandanas in their hair, hiking boots, and a granola bar in each paw – I mean hand. They were too tough to seek male companionship and they would object to a man bringing home the bacon. The only thing they were in tune with was plants and animals. 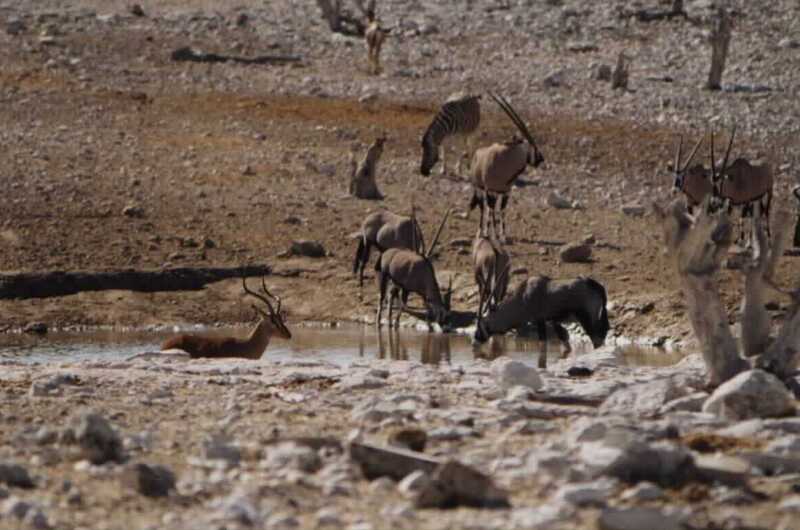 So we drank a beer and headed to the watering hole for other species. There, over the fence and under the lights, we watched a humungous elephant drink away his evening. Finally, his son came along and told him his wife wanted him to come home for the night. He staggered away. Actually – he was very graceful and fluid in his movements and seeing #1 of the Big 5 was quite exciting. He was awesome. After Sam and I went to sleep, Paul went back and saw several more elephants and some rhinos. He tried to wake us up, but both of us were in the midst of malaria-pill induced dreams about Salma Hayek and Catherine Zeta-Jones respectively.